I've seen the Salon Express nail stamping kit on tv and have always wondered if they work. Amazon was selling them for only 7 dollars so I decided to give it a try. They did not come with nail polish so I used nail art polish that I bought from the Japanese dollar store. From the reviews online people say the Konad nail polish is the best, but it cost just as much as the stamping kit so I decided to just go with the cheapie polish. Overall I was impressed by the stamping. I did buy other plates off ebay, that were only a couple of bucks. My daughter loves Hello Kitty so I bought that one for her. The patterns are pretty cool and it works well. 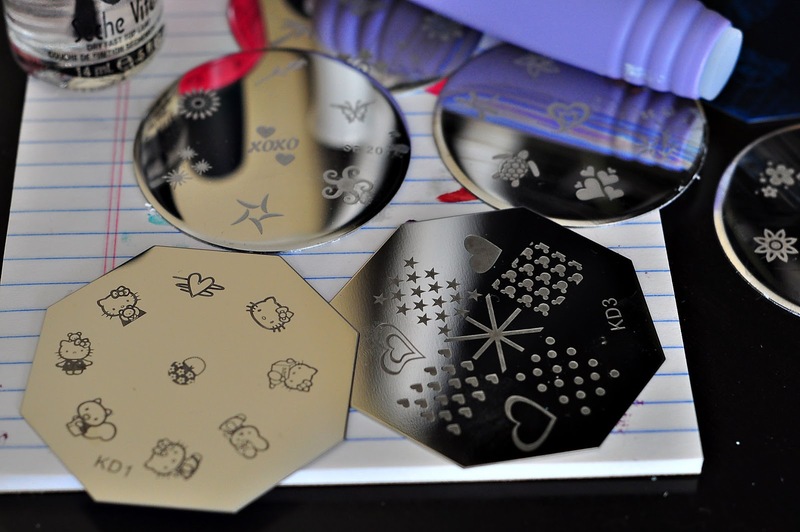 Nail stamping is also strangely addicting. I normally don't paint my nails that often but found myself painting them every week just to try new patterns. 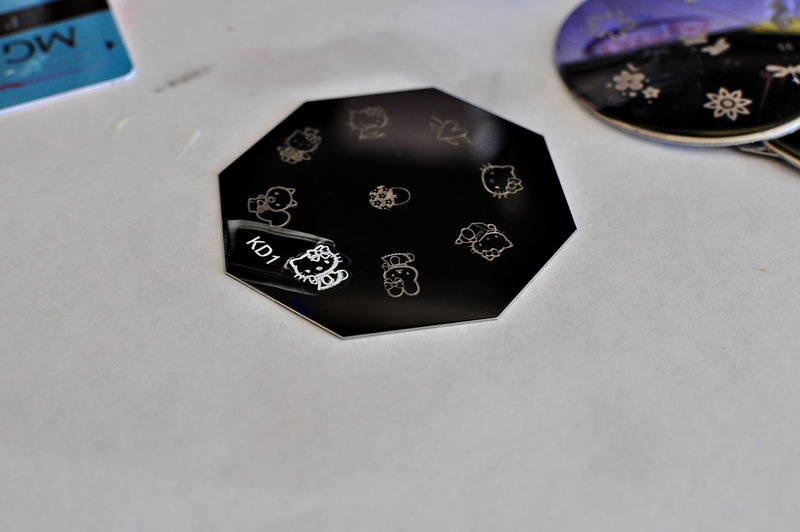 The round nail plates are from salon express, the octagon plates are from ebay. They were shipped from China and took about 2 weeks to arrive. Dollar store winwax nail polish. I opened the cap for a couple of days and dried it out a bit to get it to stamp better. Use a credit card to swipe off. The kit comes with a metal scraper, but I found that the credit card works better. 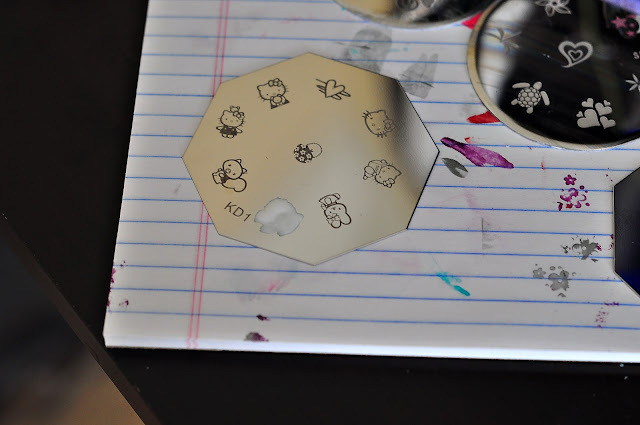 After you swipe off the polish the image can be seen clearly. 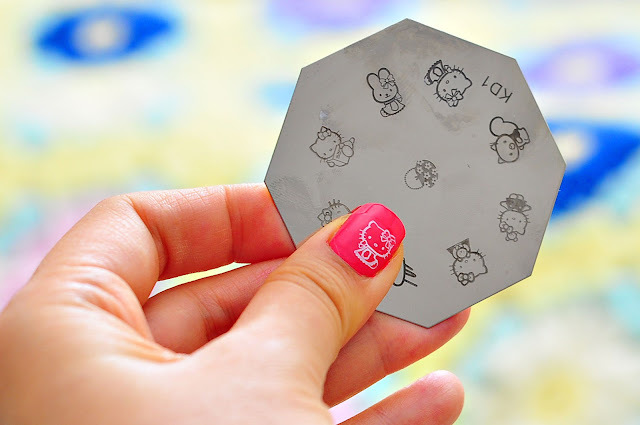 Use the rubber stamper to pick up the polish and then stamp on nail. You have to do this relatively fast or else the polish will dry on the stamper and will not stamp. 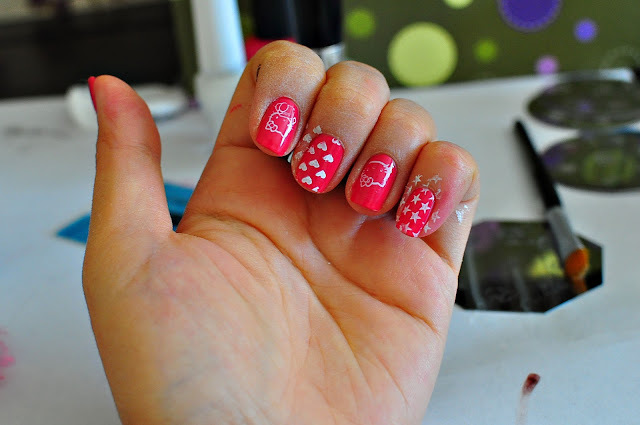 Hello Kitty nails that my daughter loves. If you do patterns you will have to remove the polish from your cuticles. I use a concealer brush and nail polish remove to do this. That makes it easier so you don't mess up your existing polish on your other hand. I normally wouldn't paint my nails in Hello Kitty, but it really entertains my daughter when I do. I hate wasting wrapping paper. You know when you cut the paper to fit a present and have a little bit left that is too small to wrap another present? 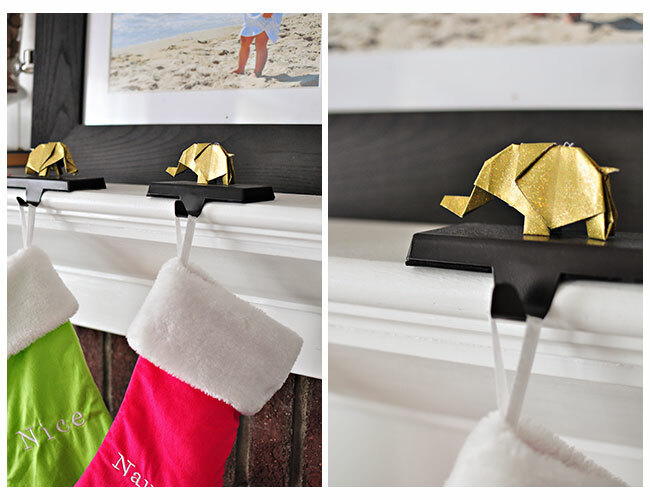 This is the perfect use for it: origami elephant ornaments. 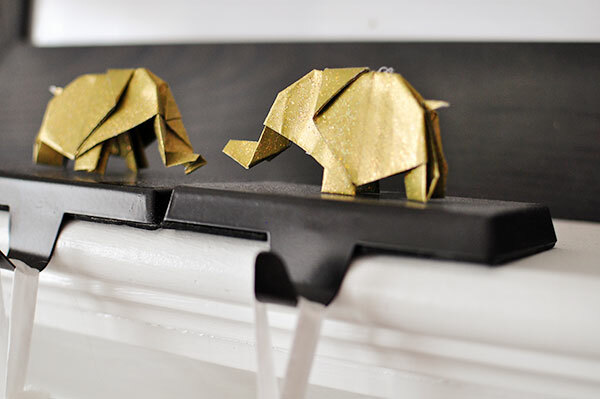 Make these cute origami elephants this holiday. I made a few to put on my stocking hangers and I also make some for our Christmas tree. Origami ornaments are the best because they are cheap, they pack up small and they can be cute too. 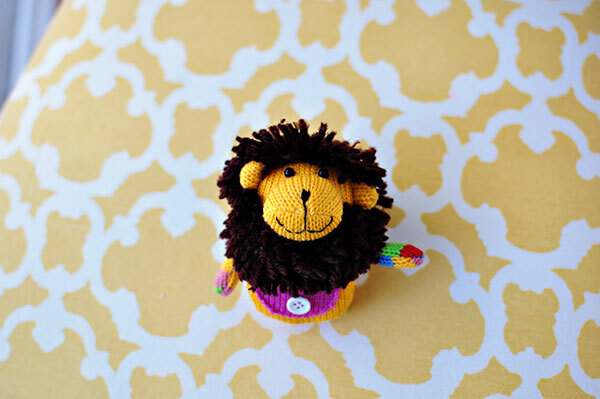 To make this ornament I used gold glitter wrapping paper scraps. See my video tutorial here. These little elephants are so cute I may keep them up year round. 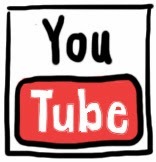 This is a simple tutorial of something that I love. I made this custom voice ornament this Christmas. I love it because it has my daughter's voice on it and I'll be able to cherish it for years to come. 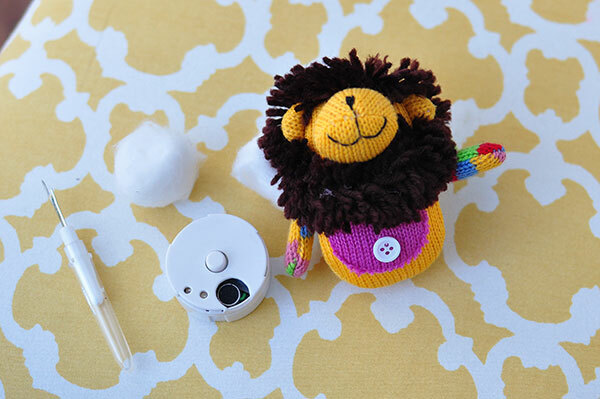 To make this you need an fabric, felt or knitted ornament (mine is from Target), recordable device (Amazon or Consumer Crafts has them), seam ripper, needle and thread and cotton balls (to fill the sides back of the ornament). large enough to hold the recordable device. 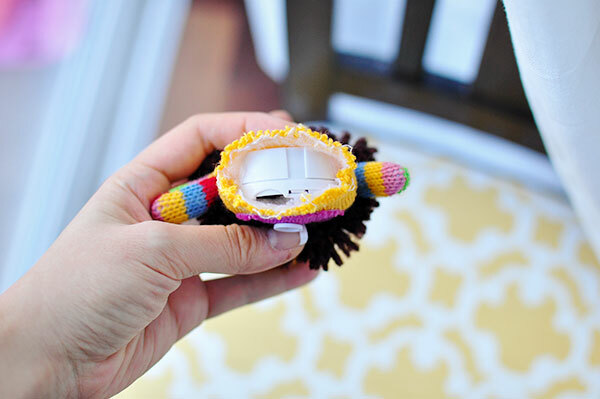 Record the message onto the device before you sew it in the ornament. Using the seam ripper find a seam to remove that will fit the recordable device. Remove the existing filling. 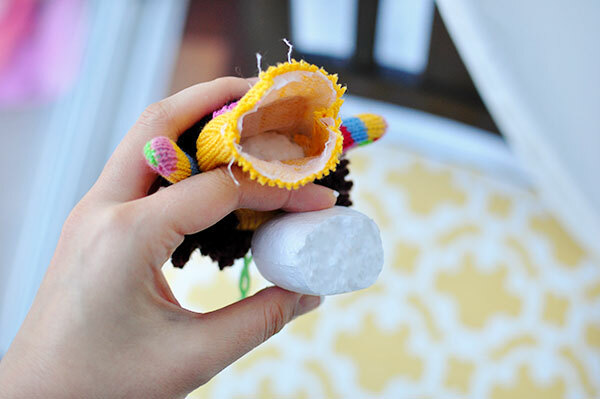 Mine had foam in it so I broke off the body part but left the foam in the head of the lion ornament. Insert recordable device in (I added a little cotton to keep it fluffy. 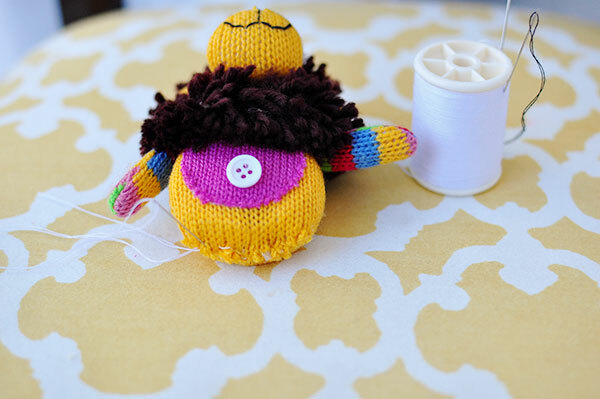 Using a blind stitch sew back up the ornament. Hang your ornament on the tree and enjoy it for years to come. I love personalized things. It's because growing up, when my relatives would buy me souvenirs, I would always get the one that said "# 1 Girl" or sometimes "Renee"(which apparently was close enough), because Rena is not a common name. I made these personalized name tags for the holidays for all the kids in the family. 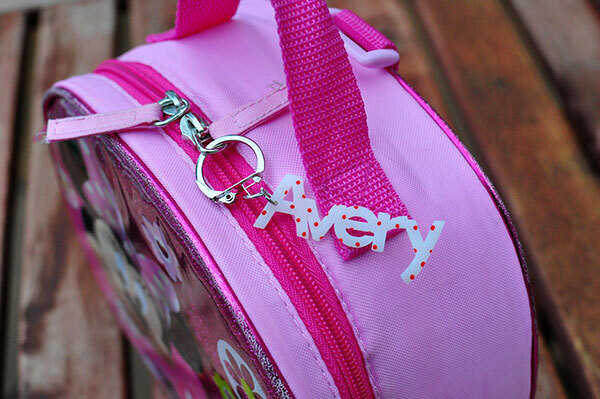 The name tags can be attached to a lunch box, back pack or a jacket or anything that needs some identification. 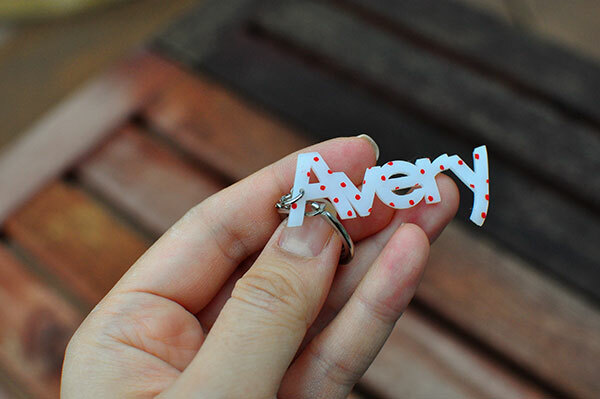 To make these tags you needs shrink plastic, 1/8 inch hole punch, a jump ring, a key chain loop, sharpie (optional) and a die cut machine (or if you are really good with a craft knife you can use that too). make sure all the letters are overlapped with good thickness, or the tag may break at the thin areas. 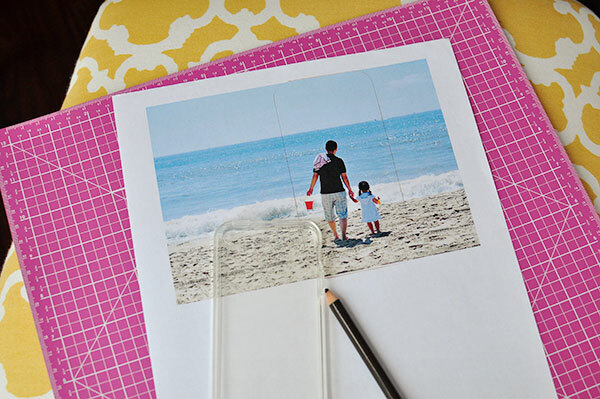 you should use a larger hole punch. To draw on polka dots I used a pattern as a template and just followed the dots with a sharpie. see the pattern through the plastic. 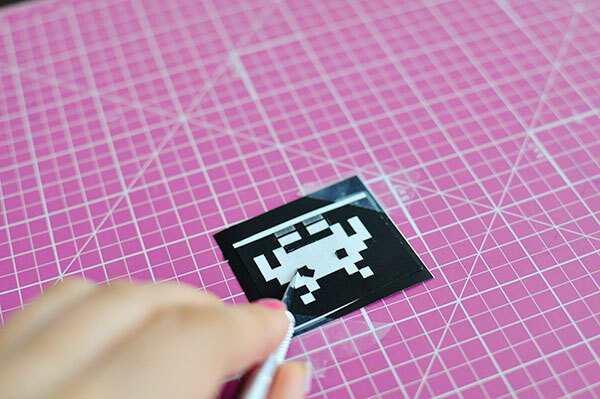 Follow the instruction on the shrink plastic to shrink. 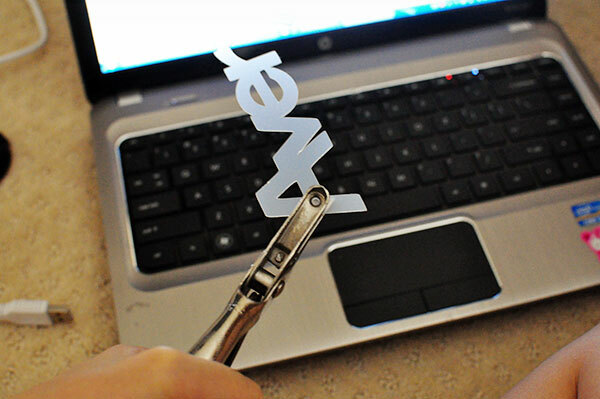 After plastic is cooled attach key chain. A few weeks ago I was at the mall and saw a young woman wearing a lanyard bracelet. It wasn't like the fourth grade lanyard bracelets that was tied to a keychain ring, it was more elegant, with metal finishing. I really liked it because it reminded me of childhood, but with a sophisticated touch. 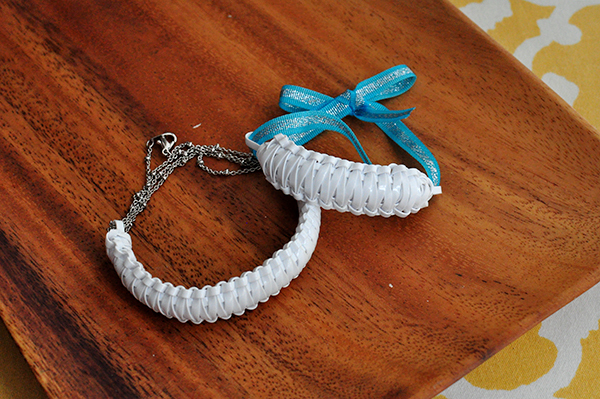 I remember making these lanyard bracelets for months on end in the third and fourth grade. There was the box stitch, barrel stitch, rope, Chinese staircase, butterfly, cobra and extensions like the double barrel and double box etc. I asked the women where she bought the bracelet and she said that her sister bought it online somewhere, but she did not know where. I searched but could not find it so I decided to try to make it. I loved making these back then so making it again wouldn't be that hard. 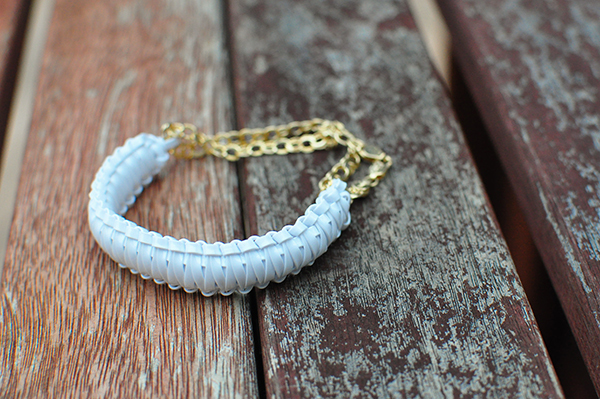 It wasn't until after I finished my video tutorial and was uploading it onto youtube that I found out that the bracelet was by a company called Helloberry. 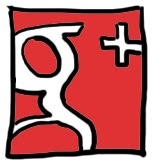 I googled "lanyard bracelet" so many times and couldn't find it. 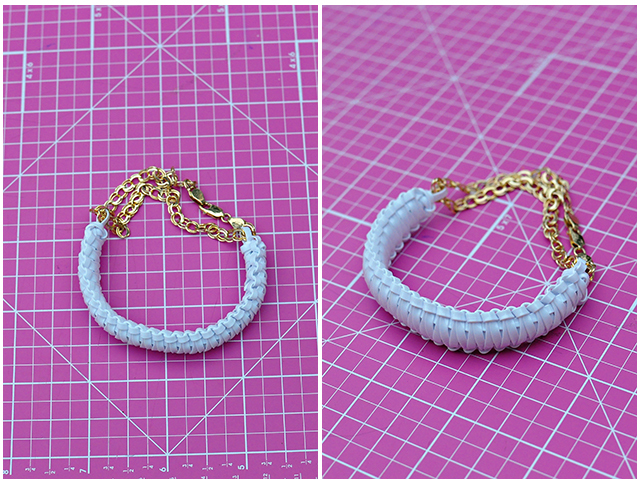 So here is my tutorial on the Helloberry Inspired bracelet. I changed it up a little, instead of putting links, I put an existing gold bracelet in place. I like this better because you can make one lanyard and change up the color of the finishing. I even put a silver necklace or a ribbon there to mix it up a little. Lanyard can be purchased at Michaels or online at amazon. Put any existing bracelet on the end. I didn't want her to lose my silver bracelets. My sister gave me a bunch of extra burlap scraps from her burlap wreath project. They have been sitting in my closet for over a year, so I finally dug them out and decided to use as embellishments for wrapping my gifts. 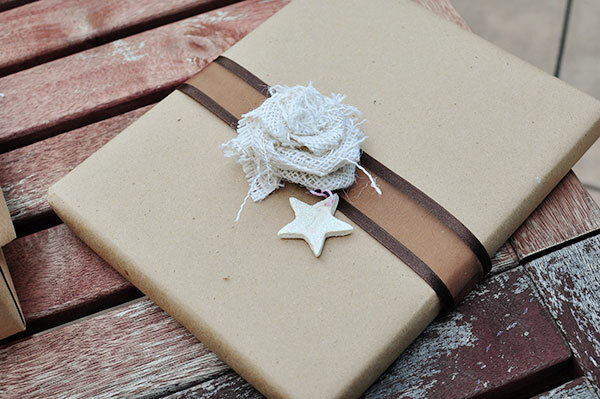 As I mentioned in my previous post, I love using craft paper as wrapping paper. 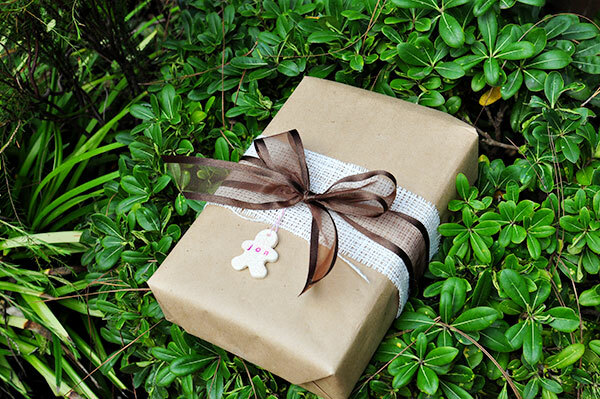 It provides such a neutral base for wrapping. 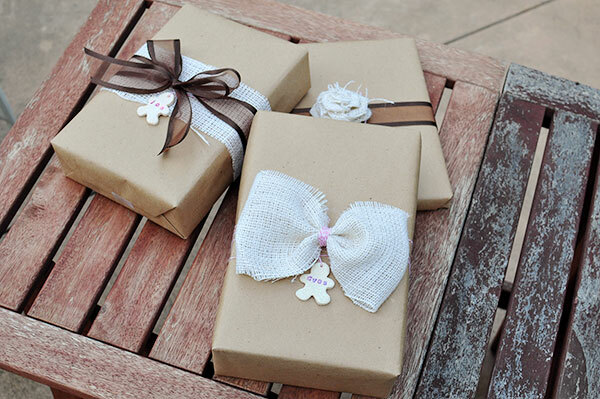 I used ribbon and my salt dough gift tags to dress up the burlap. I even attempted to make a burlap rose for one of the gifts. All in all I love the way it turned out. a big bow. 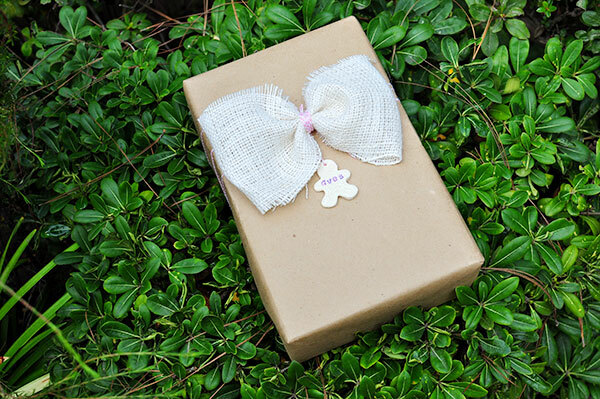 Add the salt dough gift tag, and viola, how cute is that? I hate buying new materials for crafts. Not only is it expensive, but my house is gets filled with clutter of items that I only use once or twice. I wanted to paint my glass ornaments, but did not want to buy specialty glass paint for them. 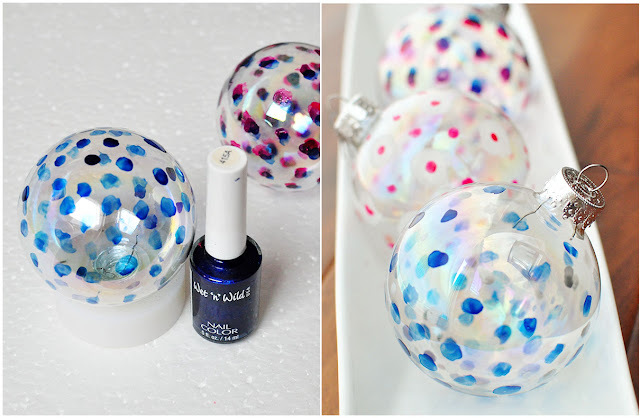 From my previous water marble tutorials, here and here, I know that nail polish works great on these ornaments. The best nail polishes to use are the more translucent colors, and from my experimenting, the cheaper the polish the better it works (probably because it isn't as pigmented and lets more light shine through). 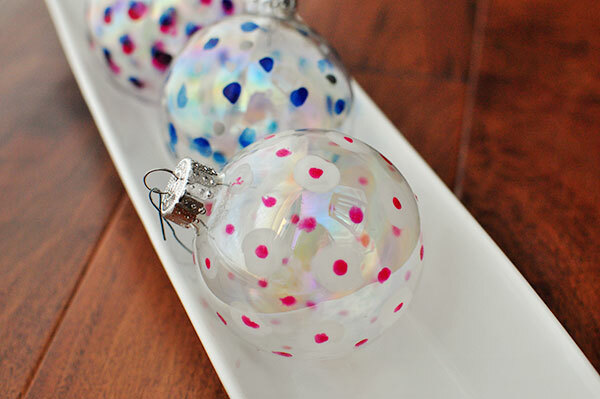 To make these faux hand blown glass ornaments, I just used nail polish and painted small to medium sized circles all around in a random pattern. You don't really have to be neat, it gives it more of the hand blown glass look if your circles aren't perfect. 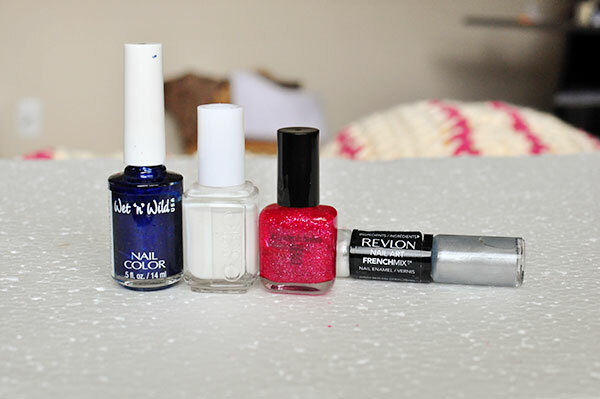 For the blue ornament I used Wet n Wild 415 A (this nail polish is at least 10 years old) and Revlon's Nail Art French Mix. For the red ornament I used Elizabeth Arden glitter polish (this is also at least 10 years old, didn't Elizabeth Arden go out of business years ago?) and Essie's Bone Chilling White (which is pretty translucent for Essie, I was highly disappointed when I used it on my nails, it takes at least 4 coats to get it opaque). Use any nail polish, the more translucent the better. wait for one color to dry before applying another. For the red ornament I did big splotches of white first and then small spots of red. As always the best thing about working with nail polish is that if you do not like your design, just use nail polish remover and wipe it off. It's so hard to find something that my husband would like. 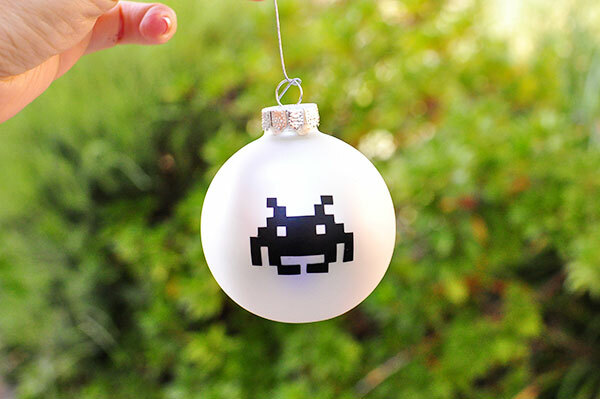 It's especially hard to make something for him (other than food) that he finds cool, until I made hims this Space Invaders ornament. 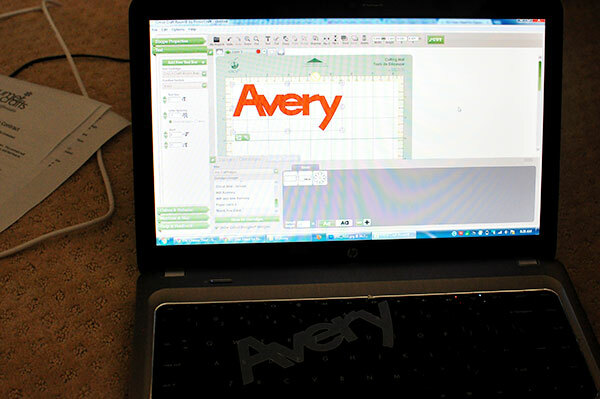 I have a Cricut Mini, but as I said before, its not very useful when you want to cut your own designs. 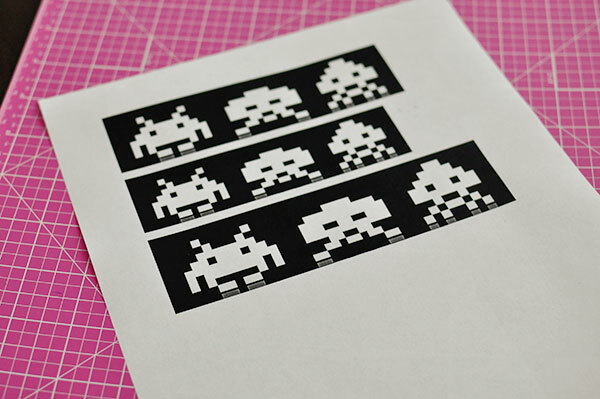 To cut this space invaders vinyl I printed out this image that I found on the internet. I did multiple sizes because I wasn't sure which one would fit the best. 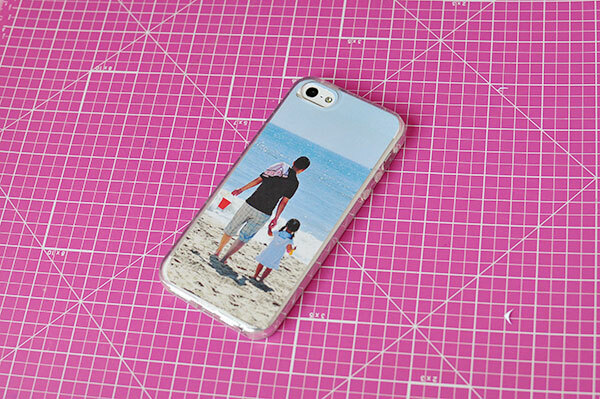 After finding the best fit I cut out the image and taped it onto a piece of black contact paper. 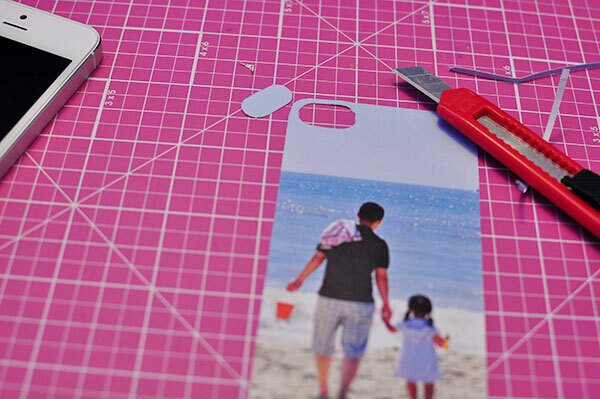 Then I used and exacto knife to hand cut the image (which isn't as hard as it sounds). 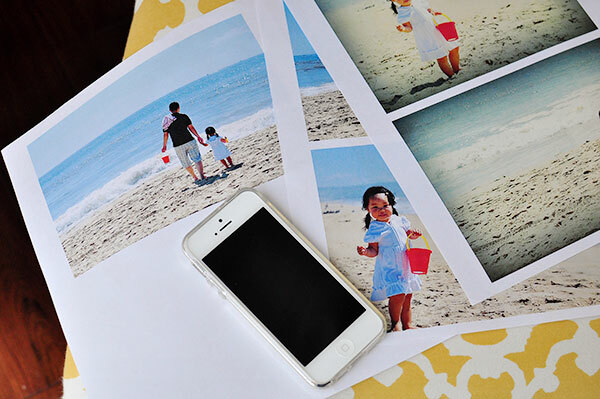 You do want to shift the pixels over a little on some of the diagonal pieces so the image is attached on a small corner. 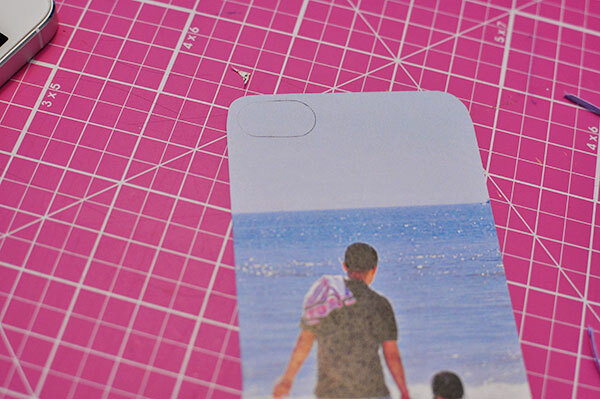 Tape on top of contact paper and cut out.